/ It’s portable! It’s protein packed! It’s perfect for picnics! It’s peanut butter! Do your kids love to snack but rarely eat a good full meal? I know mine do. To solve the “always want a snack but never eat my lunch or dinner problem” we have created what we call “snack trays”. Often for lunch at home and even more often for lunch or dinner on the go we make a tray of food choices and present it as a snack tray. May kids eat more fruits and vegetables and healthy proteins when they think they are snacking then at any other time. 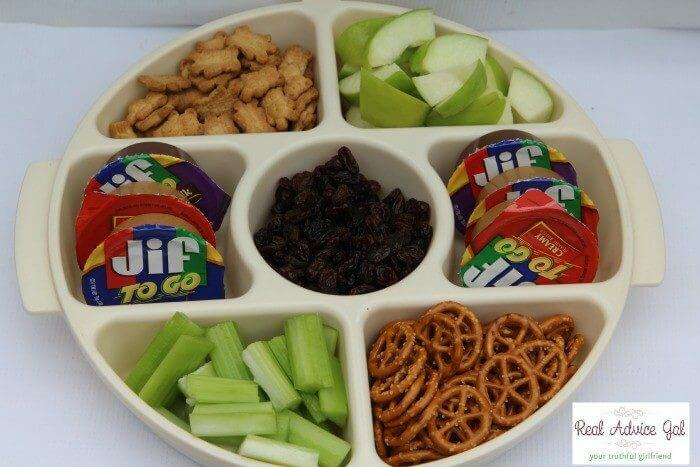 Snack trays as lunch or dinner work great when you don’t feel like cooking, when you will be at an all day sporting event (that means you soccer moms), or when you are planning a fun picnic at the park. We always pack a lunch if we know we won’t be home in time to make lunch before the kids are starving and begging for snacks. Our typical snack tray has been a bit over used. We usually have pepperoni, cheese cubes, crackers, grapes, and olives. So I have started looking for more ideas. Our “snack tray” lunch has to be portable and has to have fruits, veggies, and protein in order for me to consider it a meal. I started thinking about different protein sources since that is really the center of the meal and all the other stuff accompanies it. That is where peanut butter comes in! I have a vegetable try container that I love to use to make our snack tray meals portable. We take it to the pool, on picnics, and in the car when we are traveling. 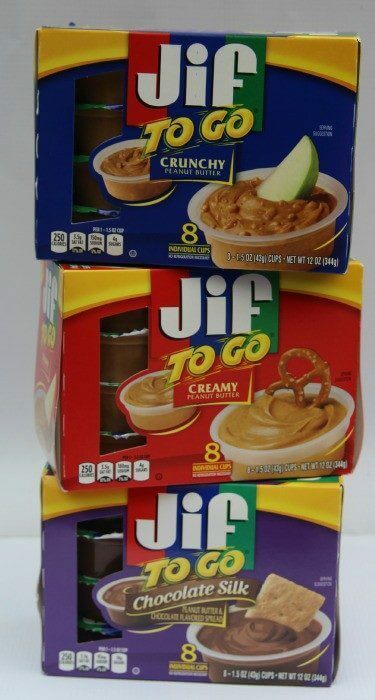 I just put all the dippers in the container along with several Jif To Go Peanut Butter packs. 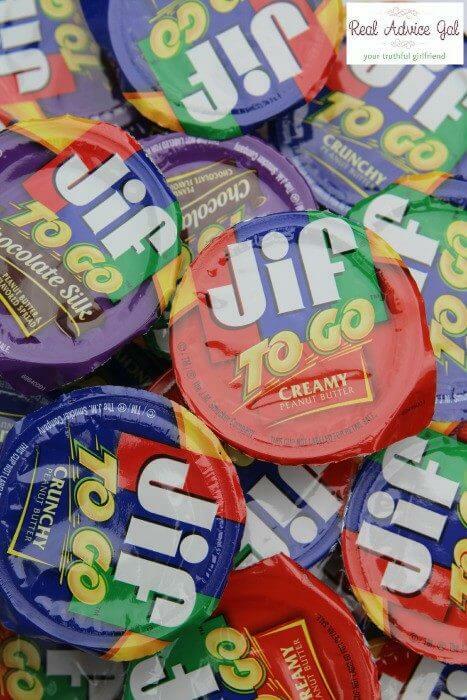 When we eat it every one can have their own peanut butter cup to dip in so no worries about double dipping and every one can choose their favorite peanut butter cup. I love smooth peanut butter, my husband loves crunchy and the kids well you guessed it they love the chocolate silk. With our peanut butter snack tray everybody gets the kind of peanut butter they want and I know they will get eat their veggies and fruit and get some protein at the same time. What are your tips and tricks for getting fruits and veggies into your kids? 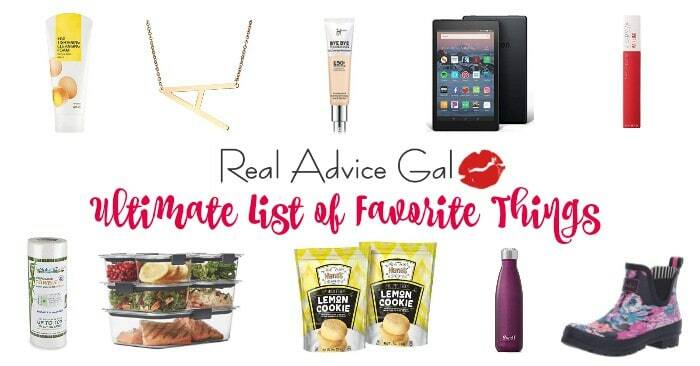 Do you all turn “snacks” into dinner?